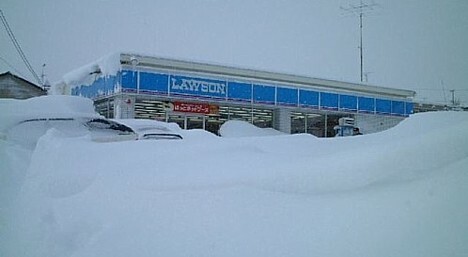 The harsh winter in Niigata, Japan brings heavy snow, which can pose problems for residents -- particularly the elderly -- who are faced with the laborious task of clearing it from driveways and entrances. 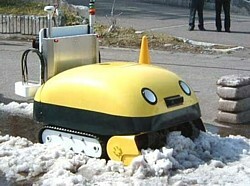 To the rescue comes Yuki-taro, an autonomous snowplow robot developed by a team of researchers from five Niigata-area organizations. The friendly-looking Yuki-taro measures 160 x 95 x 75 cm (63 x 37 x 30 in.) and weighs 400 kg (880 lbs). Armed with GPS and a pair of video cameras embedded in its eyes, the self-guided robot seeks out snow and gobbles it up into its large mouth. Yuki-taro's insides consist of a system that compresses the snow into hard blocks measuring 60 x 30 x 15 cm (24 x 12 x 6 in. ), which Yuki-taro expels from its rear end. The blocks can then be stacked and stored until summer, when they can be used as an alternative source of refrigeration or cooling. Yuki-taro is the result of nearly seven years of work by researchers from the Niigata Industrial Creation Organization (NICO), Research and Development, Inc. (RDI), Niigata Institute of Technology, Yamagata University and the Industrial Research Institute of Niigata Prefecture (IRI), who set out to design an environmentally-friendly robot that can operate by itself and support the elderly. In 2006, Yuki-taro received a Good Design Award in the small-to-medium sized enterprise category. Researchers continue to work on reducing Yuki-taro's size, weight and cost, and they hope to make it commercially available in five years at a price of less than 1 million yen ($8,300). It is unclear whether or not the researchers intend to further enhance the robot's "cute" factor, but they might ought to consider attaching a pair of pointy ears. O-negai! Very cool, when can we get one?? That is pretty neat. I know some people who could use that. Technologically Cool, but seems not practical for domestica purposes. 8K price tag, 400KG and close to size of a small car is little too much for the drive ways. Also "pooping" ice seems a novel idea, but stacking slipery and heavy ice blocks is an accident waiting to happen. Also the snow collection mechanism can gobble up a pet or worst a kid, if a sensor fails to detec "life". I-Shovel (http://www.i-shovel.com) seems more practical solution with small form factor, price and safety. That is stupid !! And it looks retarded like a kiddie toy ! The idea isn't necessarily for individual ownership, but rather for communities to own them for clearing snow in neighborhoods. You don't own a snow plow or snow blower like the highway departments use do you? Pets would most likely run from them and if they are deployed in the early morning hours to clear the streets, kids shouldn't be near them anyway. Jd, do you have a better idea or design? Don't think so. Ramblings and Travels » Blog Archive » A new way to deal with snow! 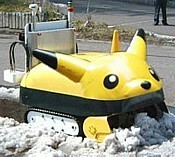 Very Spatial » Cutest snowplow……ever! It’s Yuki-Taro! Smithey’s Blog » Blog Archive » Japanese Snowplows Are Cool!